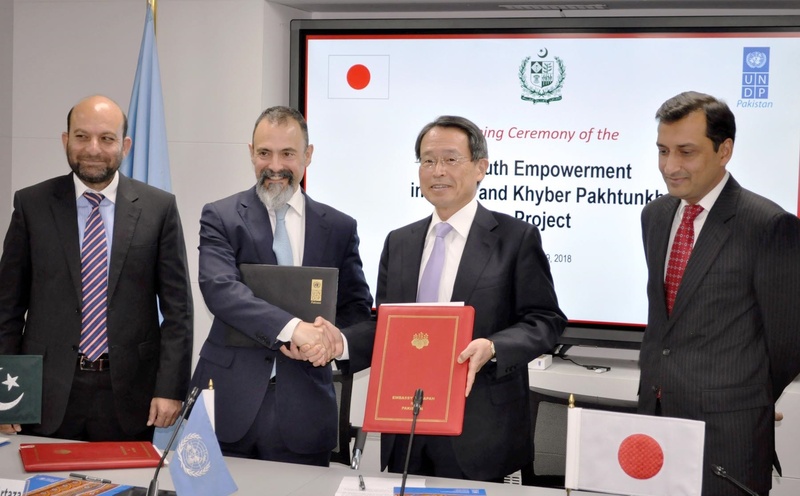 ISLAMABAD: The Japan government and the United Nations Development Programme (UNDP) on Monday signed an agreement to launch a US $3.9 million initiative aiming to empower more than 20,000 youth in Sindh and Khyber-Pakhtunkhwa (KP) provinces. This initiative will help improve employment prospects and promote social cohesion through positive interactions amongst the young people in deprived communities, helping them participate actively in the socio-economic development of Pakistan, said a statement issued here. Speaking on the occasion, Japan Ambassador Takashi Kurai said that Pakistan’s population is very young and ensuring job opportunities and income for youth is critical for its development. “Japan will continue to support youth and young women so that they can take the lead in the development of this country, which has a bright future with a young population,” he added. UNDP Country Director Ignacio Artaza said that the challenges posed by the ‘youth bulge’ in Pakistan are immense. “Almost 1.8 million jobs are required every year to absorb the growing number of young people entering the job market. The youth represent the future of Pakistan, and this is a tremendous opportunity for which we are thankful to the government of Japan,” he added. This project aligns with the government of Pakistan’s Vision 2025 roadmap and is an important step in helping Pakistan achieving its sustainable development goals (SDGs) to engage young people, provide economic growth, productive employment and decent work for all. The project builds on previous collaborations between UNDP and the Japanese government that have supported the people of Pakistan in responding to a host of development challenges, from relief and rehabilitation work in FATA to electoral reforms at the national level.